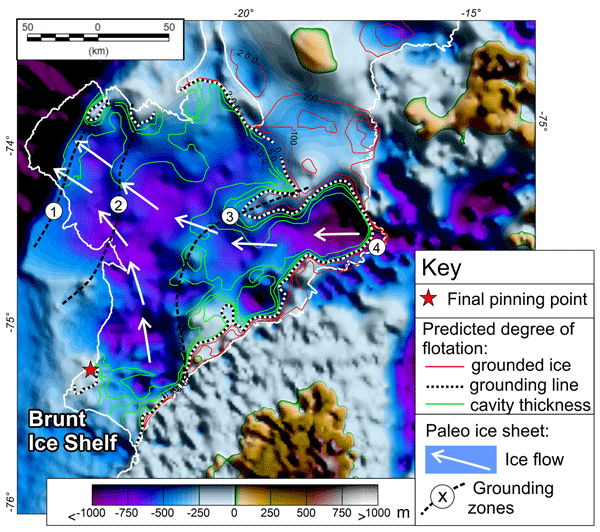 The East Antarctic Ice Sheet is thicker and larger than its western counterpart. Whether it gains or loses mass depends in part on the snowfall but this is difficult to measure and model inside the continent. Fortunately, the weather balloons launched from a network of stations along the coast provide an indirect estimate. Indeed, they track the water vapour that will eventually precipitate inland. It turns out there has been no consistent change in moisture transport from 1980 to 2017. We developed an approach to combine measurements of seven satellite altimetry missions over the Antarctic Ice Sheet. Our resulting monthly grids of elevation changes between 1978 and 2017 provide unprecedented details of the long-term and interannual variation. 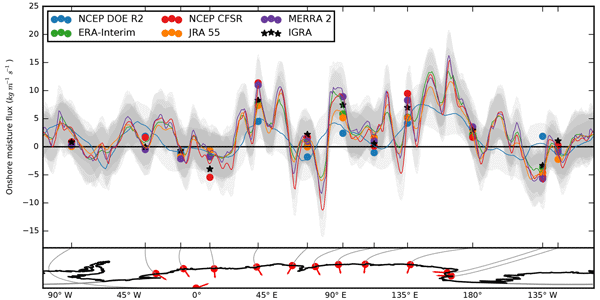 Derived mass changes agree well with contemporaneous data of surface mass balance and satellite gravimetry and show which regions were responsible for the significant accelerations of mass loss in recent years. 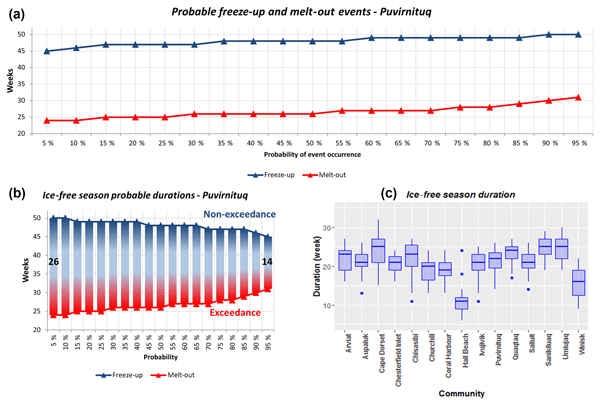 The IcePAC tool is made to estimate the probabilities of specific sea ice conditions based on historical sea ice concentration time series from the EUMETSAT OSI-409 product (12.5 km grid), modelled using the beta distribution and used to build event probability maps, which have been unavailable until now. Compared to the Canadian ice service atlas, IcePAC showed promising results in the Hudson Bay, paving the way for its usage in other regions of the cryosphere to inform stakeholders' decisions. A mass and energy balance model was subjected to sensitivity and uncertainty analysis on two different Alpine glaciers. The global sensitivity analysis allowed for a mass balance measurement independent assessment of the model sensitivity and functioned as a reduction of the model free parameter space. 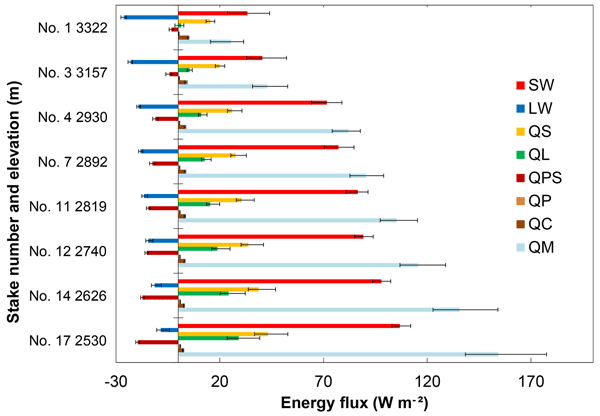 A novel approach of a multi-objective optimization estimates the uncertainty of the simulated mass balance and the energy fluxes. The final model uncertainty is up to 1300 kg m−3 per year. 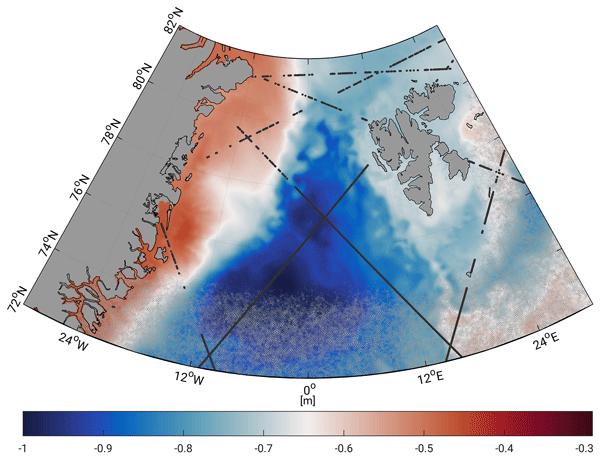 In this work, a coupled ocean and sea-ice ensemble-based assimilation system is used to assess the impact of different observations on the assimilation system. 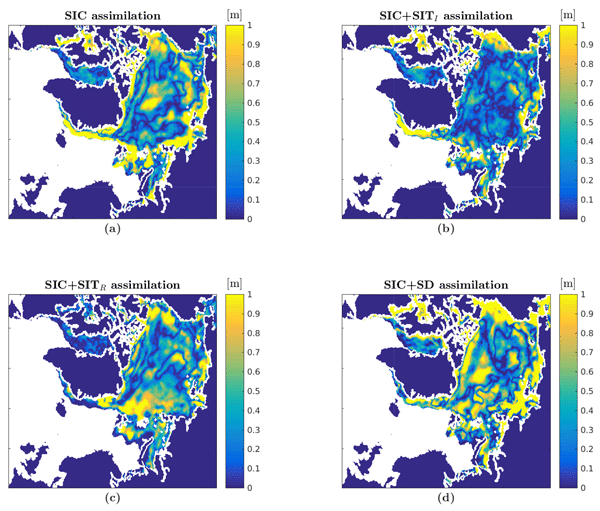 The focus of this study is on sea-ice observations, including the use of satellite observations of sea-ice concentration, sea-ice thickness and snow depth for assimilation. The study showed that assimilation of sea-ice thickness in addition to sea-ice concentration has a large positive impact on the coupled model. Many maps have been produced to estimate permafrost distribution over the Qinghai–Tibet Plateau. However the evaluation and inter-comparisons of them are poorly understood due to limited in situ measurements. We provided an in situ inventory of evidence of permafrost presence or absence, with 1475 sites over the Qinghai–Tibet Plateau. Based on the in situ measurements, our evaluation results showed a wide range of map performance, and the estimated permafrost region and area are extremely large. The Arctic is a main component of the Earth's climate system. It is fundamental to understand the behavior of Arctic sea ice coverage over time and in space due to many factors, e.g., shipping lanes, the travel and tourism industry, hunting and fishing activities, mineral resource extraction, and the potential impact on the weather in midlatitude regions. In this work we use observations and results from models to understand how variations in the sea ice thickness change over time and in space. The Brunt Ice Shelf in Antarctica is home to Halley VIa, the latest in a series of six British research stations that have occupied the ice shelf since 1956. A recent rapid growth of rifts in the Brunt Ice Shelf signals the onset of its largest calving event since records began. Here we consider whether this calving event will lead to a new steady state for the ice shelf or an unpinning from the bed, which could predispose it to accelerated flow or collapse. We present an approach for mapping bottomfast sea ice and landfast sea ice stability using Synthetic Aperture Radar Interferometry. This is the first comprehensive assessment of Arctic bottomfast sea ice extent with implications for subsea permafrost and marine habitats. 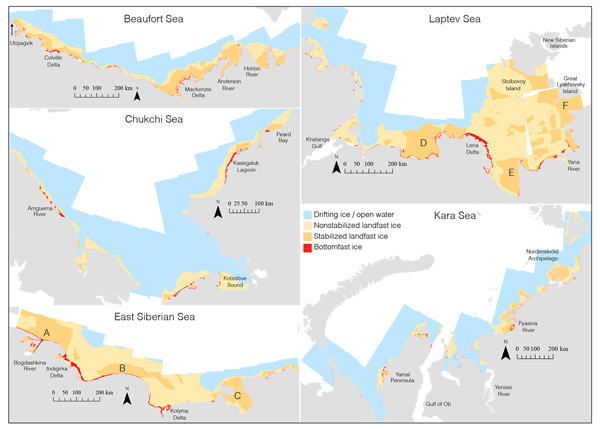 Our pan-Arctic analysis also provides a new understanding of sea ice dynamics in five marginal seas of the Arctic Ocean relevant for strategic planning and tactical decision-making for different uses of coastal ice. 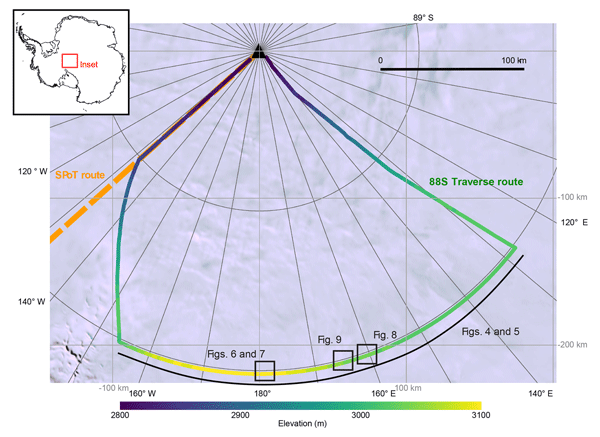 This paper provides an assessment of new GPS elevation data collected near the South Pole, Antarctica, that will ultimately be used for ICESat-2 satellite elevation data validation. 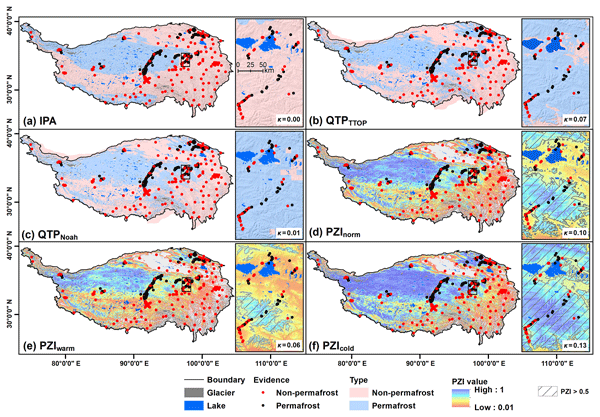 Further, using the new ground-based GPS data, this paper provides an assessment of airborne lidar elevation data collected between 2014 and 2017, which will also be used for ICESat-2 data validation. Many permafrost landscapes contain large amounts of excess ground ice, which gives rise to small-scale elevation differences. This results in lateral fluxes of snow, water, and heat, which we investigate and show how it can be accounted for in large-scale models. 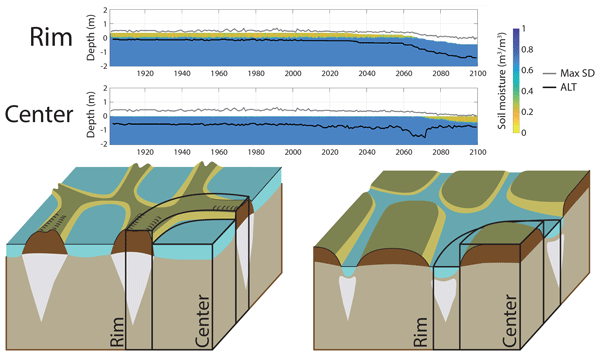 Using a novel model technique which can account for these differences, we are able to model both the current state of permafrost and how these landscapes change as permafrost thaws, in a way that could not previously be achieved. Knowledge of the dynamic ocean topography (DOT) enables studying changes of ocean surface currents. The DOT can be derived by satellite altimetry measurements or by models. However, in polar regions, altimetry-derived sea surface heights are affected by sea ice. Model representations are consistent but impacted by the underlying functional backgrounds and forcing models. The present study compares results from both data sources in order to investigate the potential for a combination of the two. Arctic sea ice is an aggregate of ice floes with various sizes. The different sizes result from constant deformation of the ice pack. If a floe breaks, open ocean is exposed in a lead. Collision of floes forms pressure ridges. Here, we present algorithms that detect and track these deformation features in satellite observations and model output. The tracked features are used to provide a comprehensive description of localized deformation of sea ice and help to understand its material properties. Permafrost peatlands store large amounts of carbon potentially vulnerable to decomposition under changing climate. We estimated effects of climate forcing biases on carbon cycling at a thawing permafrost peatland in subarctic Sweden. 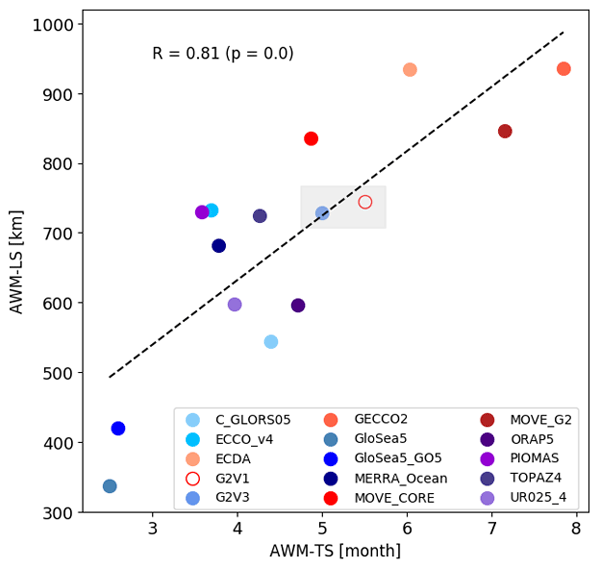 Our results indicate that many climate reanalysis products are cold and wet biased in our study region, leading to erroneous active layer depth and carbon budget estimates. Future studies should recognize the effects of climate forcing uncertainty on carbon cycling. 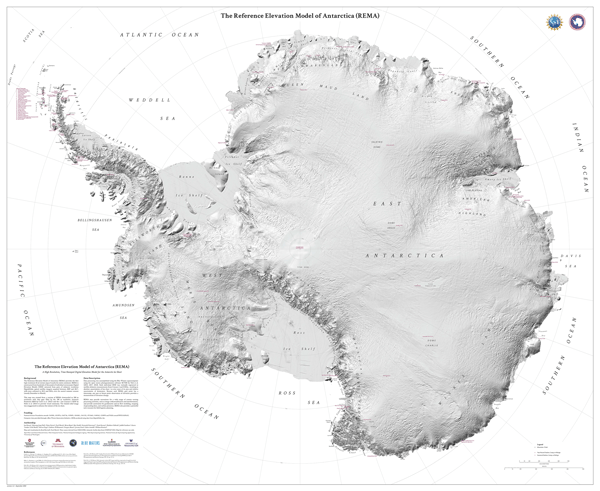 The Reference Elevation Model of Antarctica (REMA) is the first continental-scale terrain map at less than 10 m resolution, and the first with a time stamp, enabling measurements of elevation change. REMA is constructed from over 300 000 individual stereoscopic elevation models (DEMs) extracted from submeter-resolution satellite imagery. REMA is vertically registered to satellite altimetry, resulting in errors of less than 1 m over most of its area and relative uncertainties of decimeters. Sea ice thickness is important for representing atmosphere–ocean interactions in climate models. 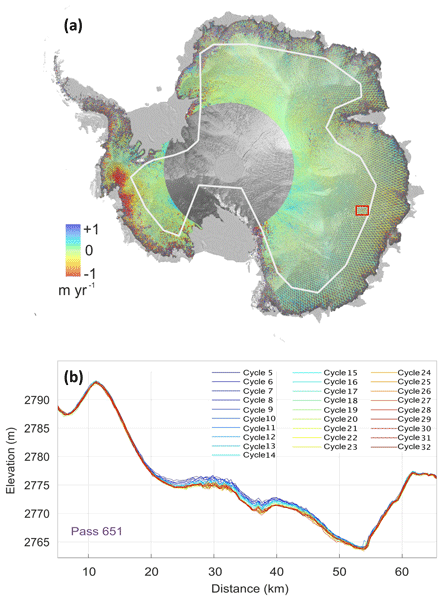 A validated satellite sea ice thickness measurement algorithm is transferred to a new sensor. The results offer a better temporal and spatial coverage of satellite measurements in the polar regions. Here we describe the calibration procedure between the two sensors, taking into account their technical differences. In addition a new filter for interference from artificial radio sources is implemented. 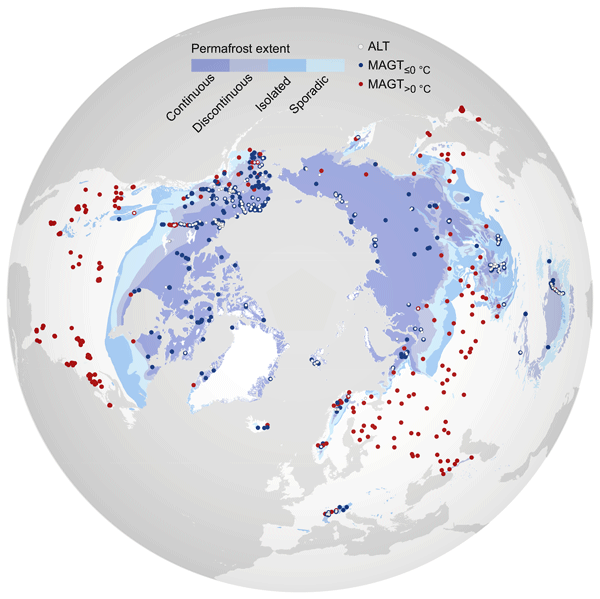 Using a statistical modelling framework, we examined the environmental factors controlling ground thermal regimes inside and outside the Northern Hemisphere permafrost domain. We found that climatic factors were paramount in both regions, but with varying relative importance and effect size. The relationships were often non-linear, especially in permafrost conditions. Our results suggest that these non-linearities should be accounted for in future ground thermal models at the hemisphere scale. Melting of the Greenland and Antarctic ice sheets is one of the main causes of current sea level rise. Understanding ice sheet change requires large-scale systematic satellite monitoring programmes. This study provides the first assessment of a new long-term source of measurements, from Sentinel-3 satellite altimetry. 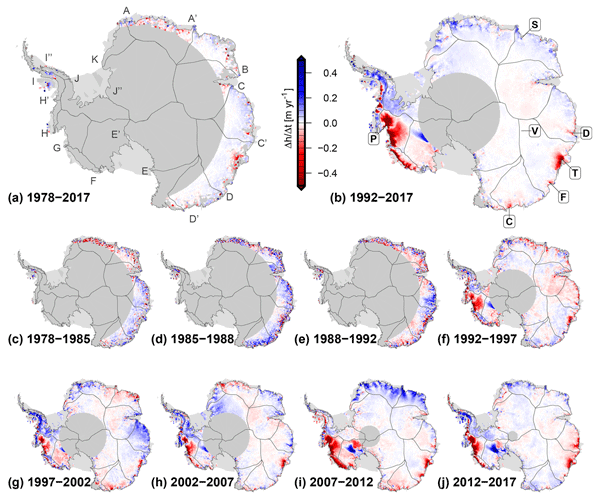 We estimate the accuracy of Sentinel-3 across Antarctica, show that the satellite can detect regions that are rapidly losing ice, and identify signs of subglacial lake activity. 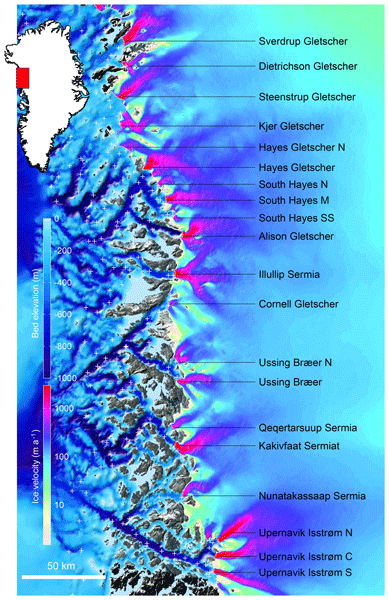 Many glaciers along the coast of Greenland have been retreating. It has been suggested that this retreat is triggered by the presence of warm water in the fjords, and surface melt at the top of the ice sheet is exacerbating this problem. Here, we quantify the vulnerability of northwestern Greenland to further warming using a numerical model. We find that in current conditions, this sector alone will contribute more than 1 cm to sea rise level by 2100, and up to 3 cm in the most extreme scenario.